Over the last two decades, employee engagement has steadily increased on the CEO agenda. Annual reports now proudly cite the emphasis the organisation is placing on their people and culture and we’re constantly hearing about new and innovative approaches. However, in today’s world, change is ever present. Businesses and indeed teams, which fail to adapt cease to exist. A report published in 2012 by Strategy&, a consulting arm of PWC, highlighted this shift. In it, it states ‘businesses are becoming more focused around capabilities and demanding that leaders of functions play a more strategic role’. With demand for leaner organisations, volatile environments and increased competition, for those working in internal communications, often regarded a functional team rather than strategic unit, there is a need and desire for those responsible for the function to be in a better position to demonstrate their value and be better aligned to the strategic vision of the business. It is no longer an option for communicators to ‘hope’ for compliance. They need to be prepared to answer questions on their approach and measure the impact they aim to have. Yet despite this, our research Why Strategy Matters suggests internal communications has yet to truly align itself with strategic organisational priorities. It’s time for a strategic intervention! To help us better understand why this is the case, we undertook research to look at the adoption and application of strategy within the sector, and for strategies which do exist, how they are put together. We spoke to 14 internal communications leaders (director level or above) and surveyed a further 60 practitioners all of whom had responsibility for designing and delivering an internal communications programme. 7% of respondents don’t believe in their strategy! Delving into these numbers further, the picture became clearer as to why the use of strategy within the sector remains so dispersed. Formative research, or evidence-based research as it’s more commonly known as, is intended to help develop, refine and validate the final strategy prior to its implementation. To have a strategy which will have a notable impact, insight is required to ensure we are meeting audience needs. Despite this, 35% of respondents to the survey felt research to inform a strategy was a nice to have, not a must have. 49% do not undertake any research before the develop their programme. Perhaps this low adoption of strategy and use of research is the solution the conundrum which Dr Kevin Ruck poses in his book, Exploring Internal Communications where he states: ‘many in-house practitioners had yet to get across the message that internal communications is a pervasive process on which successfully business strategy depends’. Research enables evaluation to be more strategic and valuable to management. It also reduces wastage, improves effectiveness and can be cost effective. It stands to reason that the absence or lack of data and business metrics, limits internal communications capability as function to be taken seriously. Although some of the findings from our research did not offer an encouraging view, reassuringly, 85% of respondents understand the value undertaking research can play in developing a strategy which will have the impact they desire. Invest in skills: 83% would like to have more support and training in the use and application of research methods. Data and insight can lead the way: although practitioners recognise the value-adding role research can play in improving approaches to strategy, capability and understanding remains low. 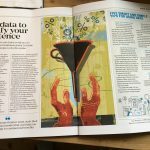 65% of those responsible for internal communications strategy have never had any formal training on working with data. A clear identity: it’s perhaps unrealistic to expect a universally-accepted definition of internal communications, but a clearly defined internal proposition, which is communicated to the rest of the business, can help clarify its purpose and focus. In doing so, internal communicators can strengthen their position and prioritise the work they need and want to do. Strength in numbers: Developing a strategy drawing on insight should not be a siloed task. We need to collaborate with other parts of the business to ensure our approaches are aligned with those of the wider business needs. Why does strategy matter? To an organisation, it aligns business objectives. To an internal communicator it becomes the life line of everything they do. Want to read the report in full? Download your copy here. To find out more about how we can help you, get in touch for a no-obligation chat.